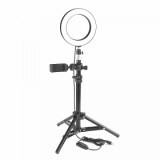 ET LED Studio Camera Ring Light uses dimmable Ring Light with a wide dimming range of from 1%-100% to meet your requests. 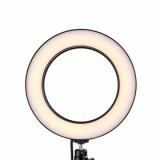 ET LED Studio Camera Ring Light uses dimmable Ring Light with a wide dimming range of from 1%-100% to meet your requests. Also, there are different types of lights, white light and warm light, to beautify your face . What's more, with a reinforced flexible arm, it will move freely. In addition, When you look into the light, 2 reflective shining rings will appear on your eyes, which is quite charming. Last but not least, you can charge it with a USB connection, which is very convenient. Ideal helper for selfies, live broadcast, make-up and photography. it is very suitable for the occasions where there is little light. I recommend it. this is good for lacking of light and make selfie more beautiful. A good product for selfie. And the shipment is fast. Delivered quickly with good condition. It's very flexible to adjust arms and two types of lights can meet your different needs of lighting. Very good quality and helpful when taking photos in dim light. Highly recommend this studio camera ring light! Compact multi-functional and practical illuminator. Fast delivery, only takes 13 days to arrive UK, recommend this seller! Very useful! Stand like a self-stick, extends about a meter. Three mode, brightness adjustable. A great thing. 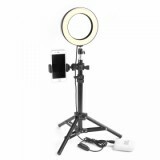 Das LED Camera Ring Light Selfie Sticks ist sowohl praktisch als auch äußerlich hübsch. Very useful tool for photography and live video. The light is very bright but not dazzling. You can easily set up, adjust and store it. I will recommend this studio camera ring light to everyone I know! Good purchase! Sehr schön! Wenn ich mich schminke und das LED Camera Ring Light verwende, kann ich mich deutlicher sehen. Praktisch und cool. I am really happy with this light. It's easy to carry and quick to set up. It works, more brighter picture with this stick. Ich bin zufrieden mit diesem Gerät, zweckmäßig und auch schön. Ich meine alle Frauen brauchen solche Spiegel. Arrived safely and quickly. Satisfied. Great ET LED Studio Camera Ring Light. This light is perfect for my videos. Good Quality, Satisfied. It's a surprise for the fast shipping speed from China. I got this camera stick with 25% off sale, fast shipping.